Chevron announced in late March that it has begun production at the third and final train of the $US54 billion Gorgon LNG project off the North West. The milestone puts the operator of the Barrow Island project on track to reach its full planned capacity. It follows production beginning on the first train 12 months ago and the second in October 2016. The three trains are designed to produce 15.6 million tonnes per annum of export LNG, while Gorgon’s domestic gas plant has the capacity to supply 300 terajoules a day. Chevron Australia managing director Nigel Hearne said Gorgon was delivering an important new source of energy for customers in WA and across the Asia-Pacific region as well as a significant investment in the national economy. “This is a key milestone for the Gorgon joint venture participants, our workforce, customers, government and all those associated with the project over its lifetime should be extremely proud,” Mr Hearne said. The Gorgon project is a joint venture between Chevron (47.3 per cent), ExxonMobil (25 per cent), Shell (25 per cent), Osaka Gas (1.25 per cent), Tokyo Gas (one percent) and JERA (0.417 per cent). The third train’s start has come while Gorgon’s train two is temporarily suspended. Chevron yesterday said it was because of a planned turnaround to enhance the train’s reliability. 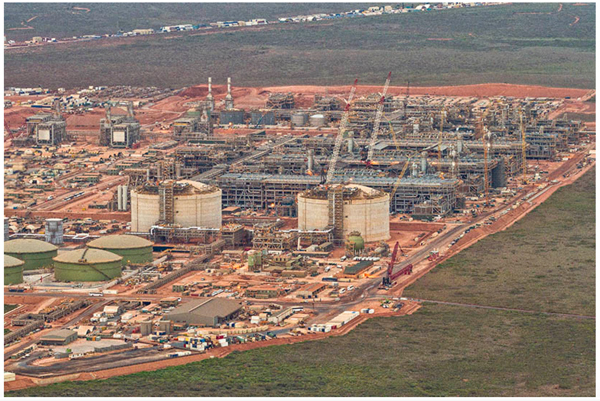 In May 2016, Chevron received federal environmental approval to build a fourth processing line for its Gorgon LNG project on Barrow Island. If and when a fourth train is added, it would make Gorgon Australia’s largest LNG producer, ahead of the North West Shelf, with five trains at 16.3 mtpa. The approval is valid until the first of January 2070.